On 26th May, 2014, The newly elected prime minister of India, Mr. Narendra Modi has takes the oath of office as the Prime Minister of India. Since then, they started working and today he completes almost a year as a Prime Minister. As he finished his first year, here we bring you some achievements and failures of Narendra Modi. Since he become the 15th Prime Minister of India with biggest mandate in last 30 years, people of india has lots of expectations from Prime Minister. He has promised Black money to be bring back in india from swiss banks (though we don't find any proof that he promised it in 100 days), to build 100 smart cities in india, Toilets for all, Insurance for all, 24*7 electricity for all Indians, Home for all Indians by 2022,to build Digital India (by giving broadband service in all rural areas on india), Bullet train etc etc. Let's take a look at each promises, one by one. So, these were promises made by Narendra Modi Government year before, they came in power. In last one year, Prime Minister has changed and expanded his cabinet only one time.Now, there are total 26 Cabinet Ministers, 39 minister of state. So total 65 ministers are there after one time expansion of cabinet. We are covering this as Narendra Modi government has promised "Minimum Government, Maximum Governance" Concept, So, yes, he has less ministers then previous UPA Government. No doubt it is big issue, and looks Modi government is quite focused and serious to bring back black money. Modi's first cabinet meeting has passed resolution to form SIT (Special Investigation Team) to bring back money, on the order of Supreme Court (which previous UPA Government has neglected). Also, Modi Government has passed Black Money Bill from both upper house and lower house of parliament, which has provision to give up to 10 years of jail for those who have black money with high amount of penalty. And so far, SIT has crack down 300+ black money cases in India. Modi was also succeed in raising issue of black money in G20 summit, G20 countries agreed for Close Coordination. The most attractive promise of Narendra Modi government was to build 100 smart cities. Since, Narendra Modi him self has done many foreign visits, they done MOUs with foreign countries who will help India to build smart cities. Counties like Japan, Australia, Russia, United States of America, China, United Kingdom etc are going to help India to build smart cities. Also, Narendra Modi cabinet has passed Rs.76,000cr for smart cities, recently. The 1st Smart city of India is all set to inaugurated next year in Gujarat, Gujarat GIFT city will be India's first Smart city. By Swachch Bharat Mission which was started from 2nd october, 2014, many states has build toilets all across india and many celebrities has participated in this missions, and also some ministers too. Modi has succeeded in building awareness in people about cleanness by this mission, for sure. we have heard that modi is quite strict for their MPs to attend Parliament sessions, take part in discussions and ask questions. Well, the figures are quite impressive. 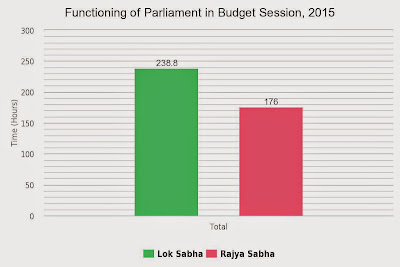 According to the PRS Legislative Research, the Rajya Sabha registered productivity of 102% whereas the Lok Sabha's productivity came in at 123%. Oh Yes, our MPs are now attending Parliament regularly. It is noted down that in Rajya sabha BJP don't have majority and in Loksabha they are largest party. And as per report, in Loksabha Average attendance of BJP MP is 90% (impressive). Now coming to other promises vs achievements Narendra modi government made in last one year. In below table you can check the reality of building rural roads, power generation, micro irrigation, broadband expansion etc work statistics. 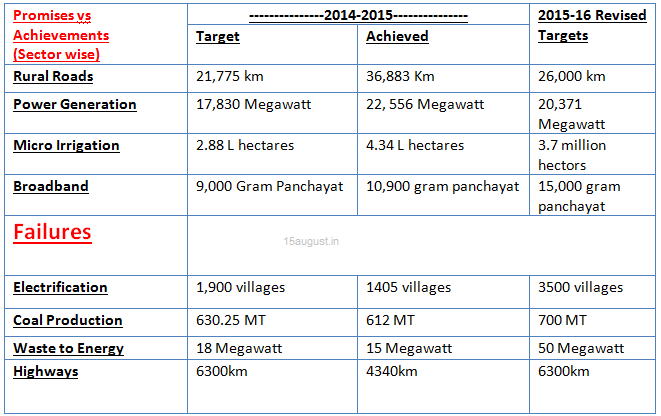 So, as you can see on the above table, there are massive success modi government achieved in making rural roads, power generations, micro irrigation, and spreading wings of Digital India. But also they got failed in coal production, electrification, waste of energy, highways constructions. In other achievements, modi government was quite good at providing help to nepal on earthquake by running operation Maitri, in bringing back Indians from Yemen, flood relief work in jammu and Kashmir, making good relation with china, sri lanka, Bangladesh. They solved issue of border with Bangladesh few days back, cabinet passed land according bill. Narendra Modi's speech in United Nations also given high value to india, since after Narendra Modi's Recommendations, United Nations agrees to celebrate International Yoga Day on 21st June every year. Modi government was quite failed with giving strong response with Pakistan,Terrorist Lakhvi got released even on bail in Pakistan. No doubt indian army given strong answer of cease fire violation. Modi government quite assured our permanent seat in United Nations, after Barack Obama (president of United states) assured their support. Also, Visiting china, UK, Brazil, G 20counries. India's Economic creditability increased after Moody, World bank, United Nation improved India's Rating. Jan Dhan Yojana was biggest success of Modi government, and now they launched 3 more social security schemes, Atal Pension Yojana, PM suraksha bima yojana, PM Jeevan Jyoti Bima Yojana. Narendra Modi government launched many new web portals that helps indian citizens to get in connection with indian government. Narendra Modi government is quite busy in promoting things, marketing instead of work even more faster. Loosing elections with big margin (Delhi) is not good for image of modi government. Modi Government should caution from being Anti-farmer image. Providing open space for Kashmir separatist leader is not good for India. Well, these are our analysis based on facts and figures. 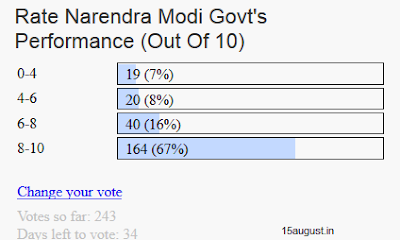 Lets check what is public opinion about one year performance. We have asked (on our website)via poll to our visitors that what they rating modi government's performance. We have 4 option to rate it out of 10, 0-4, 4-6, 6-8 or 8-10 marks out of 10 to modi government, and result were quite interesting. As you can see on above screen shot, So far we got 243 votes out of, 164 people (67%) given 8-10 rating, 40 people (16%) given 6-8 rating, 20 people (8%) given 4-6 rating and 19 people (7%) given 0-4 rating. Its genuine poll result, and as per poll results, Indian people are quite happy with Modi government in 1st year, since 67% people give 8+ rating. Do you have any comments on 1st year of modi government? Do let us know what you say about 1st year performance of Modi Government in below comments, Thank you.